Jim Mott (’96 + ’12) is a Rochester-based painter and part-time environmental consultant. His work tends toward expressive, small-panel landscape painting, although there are occasional large canvases and departures into abstraction. He also hits the road periodically with his Itinerant Artist Project (IAP), staying with strangers, painting the surroundings wherever he ends up, and “exchanging art for hospitality across America.” The IAP has led to some interesting opportunities and experiences, such as a Today Show appearance and trading art for a speeding ticket in Montana. 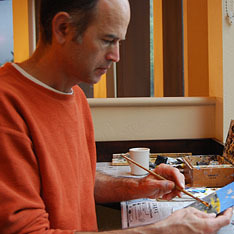 Jim earned his MFA in painting from the University of Michigan; a BS in environmental science from SUNY Brockport; and a BA in religion and visual studies from Dartmouth College. He is married to the writer Sonja Livingston.